It’s true; I found yet another excuse to visit Cistus. 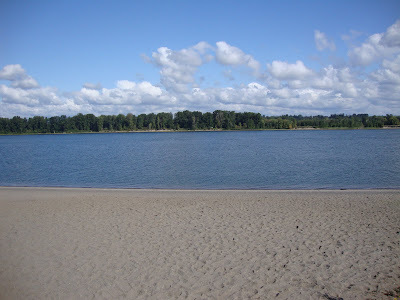 My parents were in town last weekend and they’ve never been, so we decided to make a day of it on Sauvie Island. There are several small farms on the island that host fun fall activities including pumpkin patches, corn mazes, and hay rides. We visited one, enjoyed a tasty slice of pumpkin pie, watched a 500 lb pig and a chicken “share” a meal and bought a few crisp tasty asian pears to take home. It went on forever along the beach. Scary. Last but not least we visited Cistus. Naturally there were plenty of new things to see, and want. 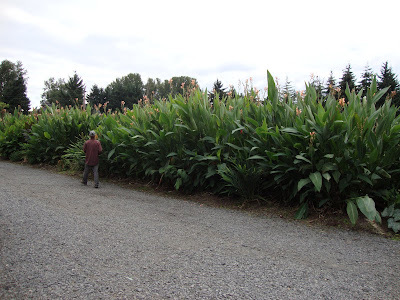 When we were there in July this wall of Canna’s and Ginger next to the parking lot was not nearly this tall. 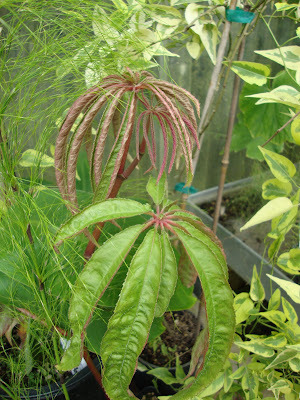 Begonia luxurians, or Palm leaf Begonia, only hardy to zone 10. Otherwise I would have taken this one home. This Eryngium pandanifolium, or False Screw Pine, was HUGE, and eventually gets over 8 ft tall. I wanted it, I really really wanted it. Here are a couple more. Dramatic! 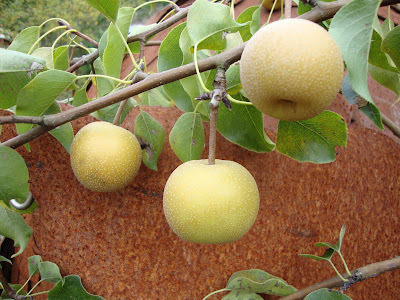 Pyrus pyrifolia ‘Shinko’ or Shinko Asian Pear. These are hardy to zone 5! I wonder if we have a place for a pear tree? I love asian pears! 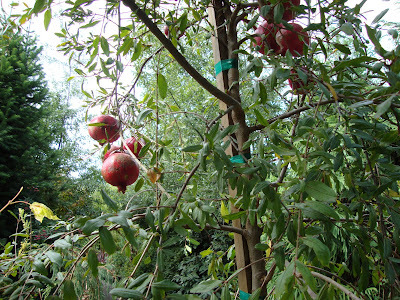 Oh and they had Pomegranate trees too! It took him awhile but he eventually relaxed and started crawling around Andrew's hand. Aren’t these yellow flowers amazing? The petals are so thick, and soft. Almost like felt, really thick felt. The vine was huge, we searched and searched and never could find where it was actually planted. 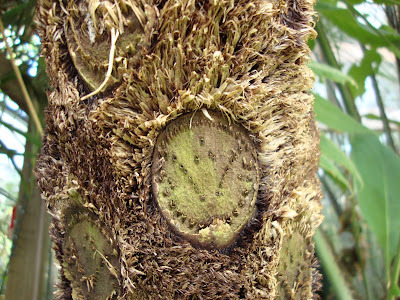 It trailed through several plants at the main entry. I’m sure I’ve walked under this tree fern many times. Somehow I’ve managed to miss it. Aren’t the patterns on the trunk interesting? So you are probably wondering when I am going to cut to the point and tell you if I bought anything? Well of course I did. Just look at this Agave lophantha 'Quadricolor' even though it means another borderline hardy agave to add to my collection it was just way too beautiful to pass up. My parents bought this Rubus parvifloris ‘Ogon’ Thimbleberry, it’s hardy in their zone 5 winters. 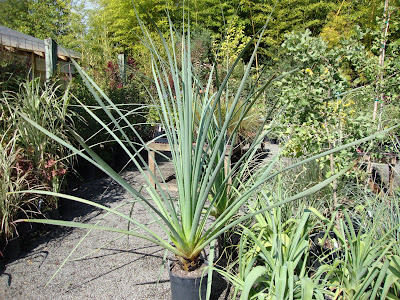 And they bought me this Agave bracteosa ‘Calamar’ which is hardy to 10-15 F, so it will be going in the ground! Although since it’s so late in the season I’ll wait to plant it out until spring. 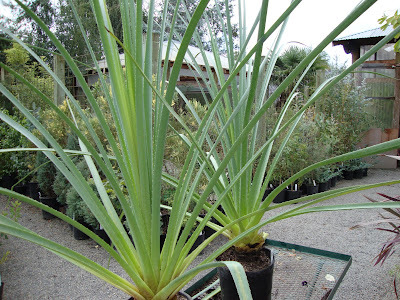 Two new agaves! Yippee! I love squid agave, though I haven't seen the non-offsetting 'Calamar' around here. I like my offsets though because I'm using them around the garden--free plants! 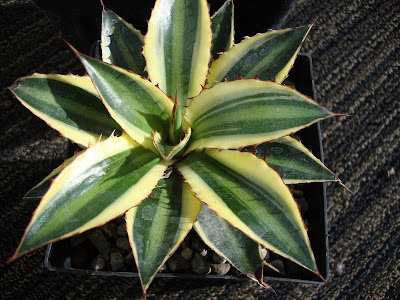 And I'm insanely jealous that you have the Agave 'Quadricolor.' I mean it, I'm green. What a great way to spend time with your family! I did the same when my brother visited in late August, but now I'm overdue for a return visit to Cistus. That A. lophantha 'Quadricolor'is beautifully glossy! Yay, you got an A. bracteosa - enjoy the octopus effect! I forgot to say: I have a friend up the street with two different asian pear trees she's had for at least ten years. They always produce and I know she does nothing with the trees to baby them. Wish knew the varieties to tell you, but anyway, they seem plenty hardy. 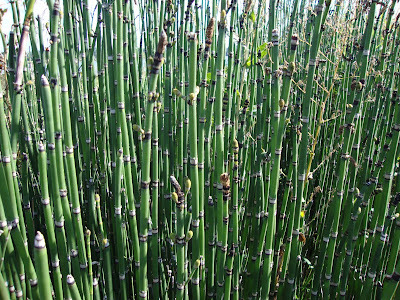 I agree, horsetail is scary. 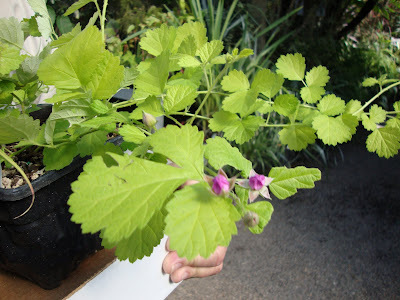 I still can't believe nurseries are selling it as a hipster plant! Geez. Well, it is a native, and hardy for millenia I guess! Your agave round-up is getting pretty hefty - you're gonna need a bigger garden pretty soon! Those look like nice additions, and very nice to shop for plants with your folks, what a cool thing that you all share the hort love. Is that vine a crazy akebia? 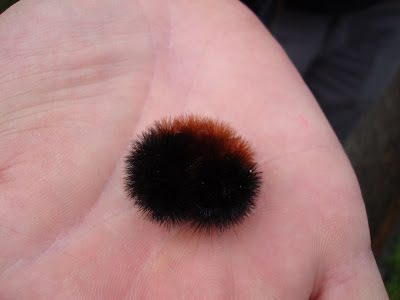 Cute caterpillar, those ones are my favorite! Love the tour, DG. And great finds. Someday I'm going to make the drive. Those are HUGE canna's!! I'm kind of glad I pulled out the ones my neighbor gave me a few years ago, I don't have enough yard for them. 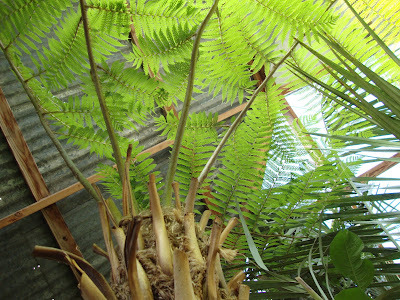 That tree fern is my favorite. I guess I've never been to Cistus in the summer, I've never seen all the cannas and ginger. It's a nursery I save for winter when I'm dying for some interesting garden spotting and city nurseries fail me, which is probably a shame, I bet I'm missing out on all the good but not hardy stuff. 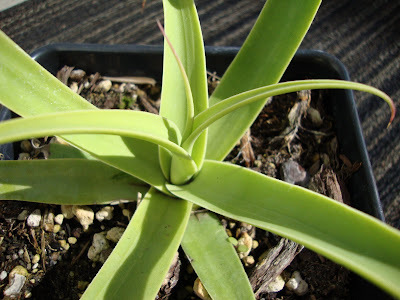 I didn't realize squid agave were so hardy. One more reason I'll need to get one, but I'll try to hold off til spring. The overwintering breakfast nook is going to get pretty crowded as it is. Pam, I am of mixed emotions about the no pups situation. Free plants is always a good thing but maybe this one will concentrate all it's energy on being the perfect specimen. There was no question in my mind when I saw the Quadricolor, it was going to be mine! Jane, last year Cistus had a fall sale, that would have been an excellent excuse for you to go back out...haven't heard of one this year. Linda, are you here in Portland? Was this a recent purchase? I'd love to hear about how the eryngium pandanifolium winters over! Karen, really!! You are right, the agave collection is getting a bit large. I think my husband is starting to worry. 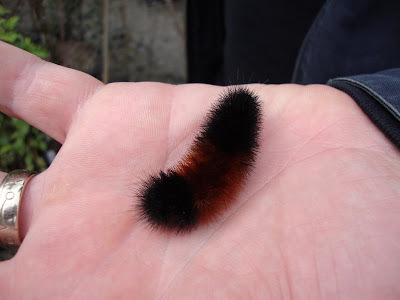 It has been FOREVER since I have seen one of those caterpillars! I wanted to take it home with us but we didn't. Grace! You haven't been? Yes...you need to make the drive! M.T. Julie, they make a nice green fence though! Megan, I can see the appeal of Cistus in the winter...but it is a fabulous place in the summer too! I hear ya about the breakfast nook. I'm looking at my "collection" and how it has grown this year and thinking we are going to have to upgrade to 3 sets of grow-lights. The electrical bill be damned. I'd love to spend a day just like you did exactly where you had ! Cistus Nursery is at the top of my Must See list. Glad that you found some fabulous plants. 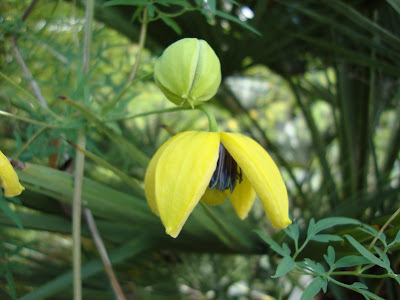 Clematis tibetana var. 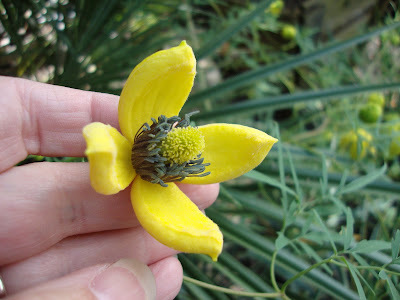 vernayi is the unidentified yellow vine, hope this helps anyone who was as interested with that little guy as I was.